Mutation is an alteration in any of the base of a DNA sequence sometime’s leading to a defective protein or prematurely terminated non-functional protein. Mutation is an alteration in any of the base of a DNA sequence sometime’s leading to a defective protein or prematurely terminated non-functional protein. Mutations are spontaneous in nature although rare (e.g sickle cell haemoglobin). In the technique of site-directed mutagenesis a Biotechnologist is able to create mutation selectively, rather than that which occurs randomly in nature. Using this technique amino acids can be substituted in the expressed proteins making them more stable or functionally better. Furthermore the role of specific amino acids in proteins has led to a better understanding of protein structure and function. 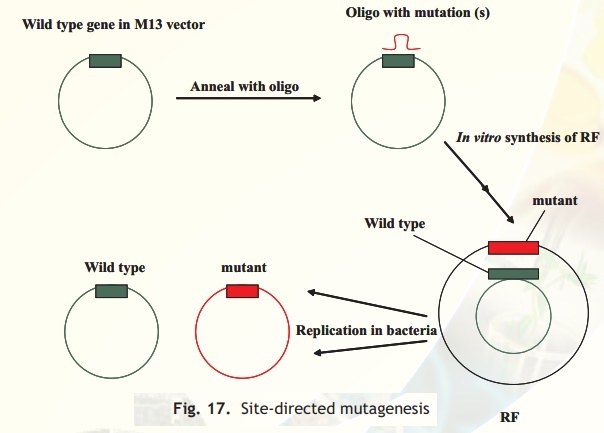 The principle of site-directed mutagenesis as schematically explained in Fig. 17 involves cloning the target gene into an M13 vector wherein it is presented as a single stranded part of the phage genome. A small oligonucleotide is added containing a complementary sequence to the gene but with one or more altered nucleotides. This allows the oligonucleotide to bind to a complementary portion in the target gene. This then acts like a primer in vitro to synthesise a double stranded replicative form. Note that the duplex RF form has one strand with the original target gene sequence, wild type and the other strand with the altered nucleotide(s). The duplex DNA molecule is then introduced into bacterial cells by transformation. Subsequent replication inside bacterial cells will produce either wild type or mutant gene containing plasmids. If appropriate expression signals are present altered protein can be expressed and studied.